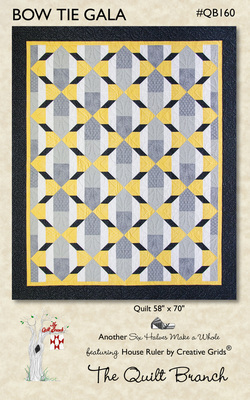 One of newest quilt patterns in the Six Halves Make a Whole series. Just choose 6 half-yard cuts (4 mediums and 2 lights) and add 2 accents for this large, lap quilt (58" x 70"). The House Ruler makes cutting this quilt out a breeze. This design is great for those wanting a more modern look. It also works well in school and team colors.